JAMES CHILD DRURY was born April 18, 1934 in New York City, where his father was a Professor of Marketing at New York University. When James was six weeks old, his mother, a native of Oregon, and the family went to the home ranch. There were many trips back and forth from their home in New York and Oregon. Through the years he spent a great deal of his boyhood on the family ranch. Jim grew up with a love for horses and the outdoor life. His maternal grandfather taught him woodsman skills and marksmanship and was a great influence on the shaping of his values. The acting bug first bit Jim at the age of 8, when he played King Herod in a children’s Christmas play. He made his professional acting debut at the age of 12 in a touring company of ‘Life With Father’. Trained as a classical actor at New York University and credited with 12 major Shakespeare roles and 18 major Shaw roles, Jim left the theatre in New York and went to Hollywood in 1954. He worked in such classic films as ‘Blackboard Jungle’, ‘Forbidden Planet’, ‘The Tender Trap’, ‘Love Me Tender’, ‘The Last Wagon’, ‘Pollyanna’, ‘Ride the High Country’ and many others. 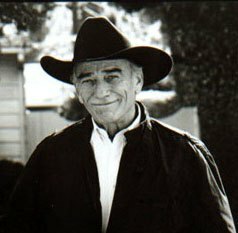 Jim was guest star in numerous television series like ‘Playhouse 90′, ‘Gunsmoke’, ‘Rifleman’, ‘Cheyenne’, ‘Alfred Hitchcock Presents’, ‘Wagon Train’, ‘Rawhide’, ‘Death Valley Days’, before being chosen for the role of ‘The Virginian’ in 1962. After portraying ‘The Virginian’ for nine years, he returned to the theatre across the U.S. in the ’70s. His stage credits are diverse with not only Shakespeare and George Bernard Shaw, but also a long line of well-known classics such as ‘The Odd Couple’, ‘The Rainmaker’, ‘A Thousand Clowns’, ‘Once More with Feeling’, ‘Forty Karats’, and ‘Prisoner of Second Avenue’ just to name a few. In 1974, he starred in television series ‘Firehouse’. Jim has appeared as Special Guest in numerous films and television shows like ‘Alias Smith and Jones’ (1971), ‘The Adventures of Brisco County, Jr. (1993), ‘Walker, Texas Ranger’ (1993), ‘Kung Fu: TLC’ (1994 and 1995), the film ‘The Virginian’ (2000) and ‘Hell to Pay’ (2005). Known for his distinctive voice, he has done many documentaries and audio books. Mr. Drury held rank of Lieutenant Commander in the United States Naval Reserve and participated in many recruiting films and public appearances for the Navy. Mr. Drury’s interests are many. An avid sportsman, he enjoys scuba diving, tennis, golf, snow skiing, sailing. He has competed successfully in Cutting Horse Competitions, as well as Polo and Dressage. 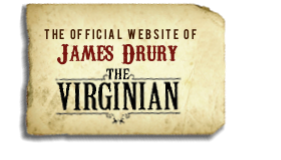 James Drury, now 84, and Carl Ann, his wife of over 39 years, reside in Houston, TX. Not considering himself in the least bit as retired, he has an extensive traveling schedule to Western Events, Festivals and Autograph Shows across the country speaking about the West and how cowboy values shaped our country and how those values still hold true to those who will adhere to them. Murder at the Mansion (1959) – Harding Jr. Bitter Heritage (1958) – Jesse James, Jr.